It's the set that never ends. 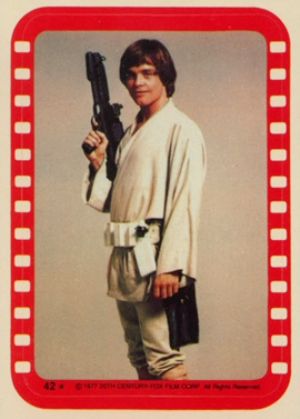 1977 Topps Star Wars Series 4 is yet another release to come out surrounding the initial Star Wars phenomenon. With collectors snatching up the first three sets, a fourth made sense. As with all the releases in the complete set, 1977 Topps Star Wars Series 4 can be recognized by its borders. This set uses green. The checklist includes an additional 66 base cards and 11 stickers. Stickers fall one per pack. Although most of the base cards stick with movie stills, several cards toward the end of the set use promotional shots. These add a little variety to a run that's now at more than 250 cards. The base set checklist runs from numbers 199 to 264. Stickers are numbered 34 to 44. They keep the film strip design introduced in the previous set. The only difference is that they use red borders instead of black. 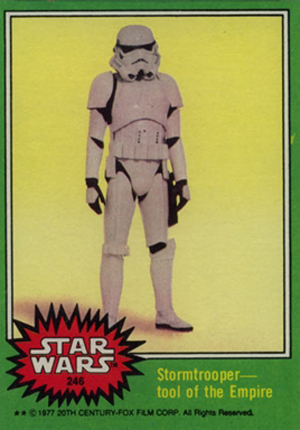 1977 Topps Star Wars Series 4 is home to one of the most notorious cards in hobby history. 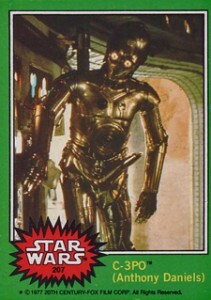 When it came out, card 207 left little to the imagination as to whether droid C-3P0 was male or female. Over the years, there has been a lot of speculation about the card. Was it a gag by the art department? Was it a visual trick created by the photo's angle? Very few people know for sure but the card has since transcended all the others in the set. It's similar to the 1989 Fleer Baseball Billy Ripken that had an obscene note written on the end of his bat knob. 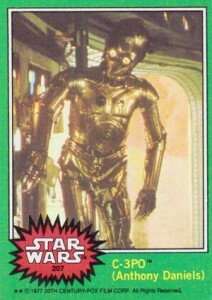 A corrected version of the C-3P0 card was produced and both seem to be available in equal quantities. However, when buying singles, expect to pay a premium, particularly for the obscene version. 66 cards. Continues from where Series 3 finished. 199 The Star Warriors Aim for Action! 201 Raid at Mos Eisley! 205 Desperate Moments for Our Heroes! 212 A Stormtrooper is Blasted! 218 Luke Skywalker's Home . . . Destroyed! 219 The Swing to Freedom! 220 "I'm Going to Regret This!" 222 "Evacuate? In our moment of triumph?" 224 Luke's secret yen for action! 232 The Empire strikes back! 243 Rebels in the trench! 251 An overjoyed Han Solo! 256 The marvelous droid See-Threepio! 259 Challenging the evil Empire! 11 stickers. Inserted one per pack. 34 The Star Warriors Aim for Action!